Gomek was a large saltwater crocodile captured by George Craig in Papua New Guinea. He was purchased by Terri and Arthur Jones in 1985 and was kept in Ocala, Florida for five years before being sold to the St. Augustine Alligator Farm Zoological Park in Florida. For 8 years he wowed spectators with both his amazing nutria-tossing abilities and his even more amazing tolerance of people. Feeders of the large croc were allowed to go into the enclosure and get as close as 1 meter from the large animal (a normally suicidal proximity) without any fear of attack (for another example of a croc with great tolerance of people, see the story of Chito and Pocho). 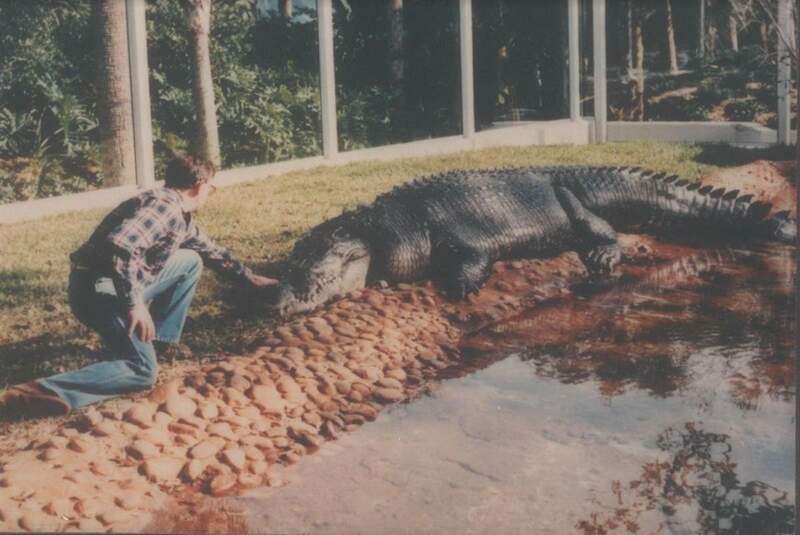 While feeders still used long tongs to feed Gomek, he was generally considered to be a “tame” crocodile and was the favorite of the Alligator farm and people around the nation. After many years, Gomek died of heart disease on March 6, 1997. By then, he was a very old crocodile, and one of the largest and tamest captive crocodile in existence. When he died, he was 5.42 metres (17.8 ft) long, and weighed 860 kg (1896 pounds) – as confirmed by St. Augustine Alligator Farm – and probably between 60 and 80 years old. There is a tribute to Gomek near his enclosure, which now houses his successor Maximo and his mate Sydney. I recently received a message from Marcus Miller, who worked with Gomek in the past. Here the message below (and his wonderful photo with Gomek). Many thanks, Mr. Miller!